Clethra alnifolia is a rhizomatous shrub with aerial stems from 1 to 3 m tall. Leaves are simple, alternate, and bear stellate hairs; petioles are short, 5–10 mm long; leaf blades are obovate to oblong, 5–10 cm long, with relatively blunt apices, cuneate (wedgelike) bases, and margins that are entire toward the base but finely serrate above the middle; venation is pinnate with secondary veins that extend to leaf margins. Stipules are lacking. Flowers are borne on erect terminal racemes that may be solitary or accompanied by additional racemes terminating few-leaved branches arising from upper nodes. Raceme axes and pedicels are minutely stellate-pubescent; individual flowers are subtended by deciduous bracts; these bracts are longer than the flower buds and therefore prominent before anthesis, but they are soon overtaken by the open flowers, and by full anthesis most bracts have been shed. Flowers are perfect (bisexual), radially symmetric, mostly 5-merous, and pungently sweet-fragrant, appearing from midsummer to late summer. Sepals are persistent, connate only at their base; petals are separate or slightly fused at their base, white or rarely pink, more or less oblong and slightly concave, especially toward their tips. 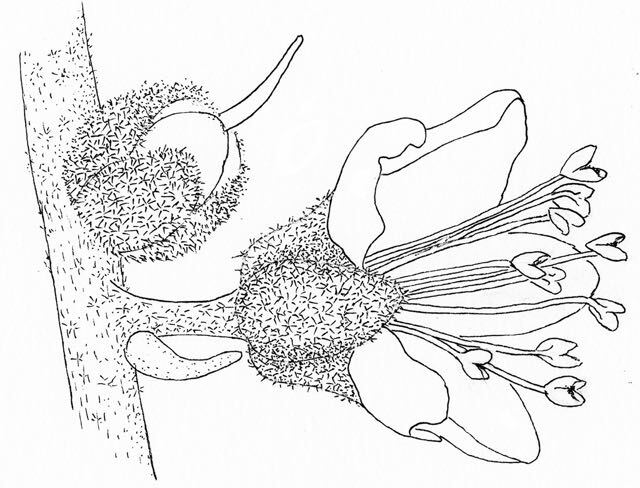 There are 10 stamens present in two whorls; anthers invert as buds open and, thus, anther bases appear to be terminal in open flowers; anthers dehisce by pores, and pollen grains are shed singly (not as tetrads). Pistils are composed of three carpels; three stigmas join to form a common style above the three-lobed ovary. Fruits are three-valved capsules containing numerous small seeds. Linnaeus named Clethra alnifolia in his monumental Species Plantarum, published in 1753. Despite only distant relationships, both parts of the binomial convey connections with alders. Clethra is an ancient Greek name for alder (Alnus, family Betulaceae), and alnifolia refers to the course of secondary veins (described above), which resembles that of alder leaves. 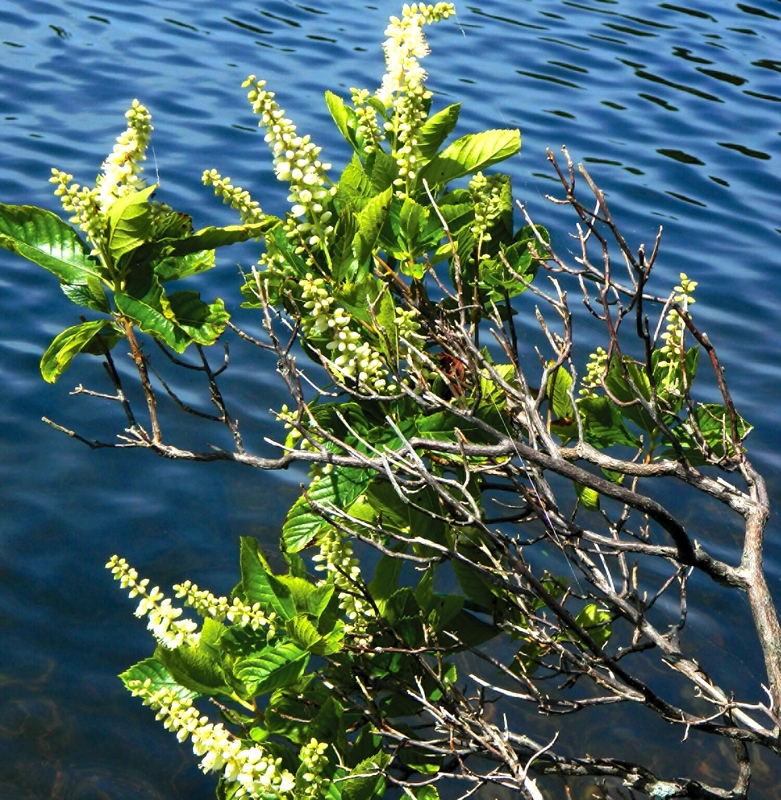 In fact, another common name for the species is White Alder. 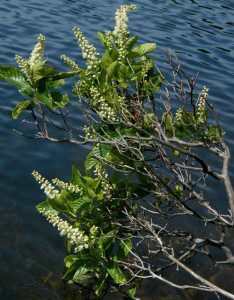 “Pepperbush” refers to the vague resemblance of its fruits to peppercorns. Clethra is a genus of some 65 species and is the only genus classified in family Clethraceae. Species of Clethra are found from eastern North America to South America, Madeira, and from eastern Asia to Malesia. Along with Cyrillaceae, Clethraceae are closely related to the large and cosmopolitan Ericaceae (Heath family). 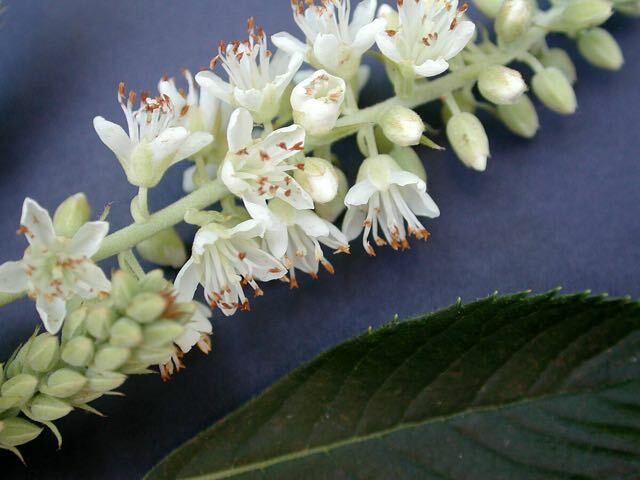 Virginia has a second species of Clethra, C. acuminata, distinguished by broader leaves and more abruptly tapering leaf tips and drooping racemes; it is restricted to the southern Appalachian Mountains. Aside from its obvious importance in natural communities and its value as a garden plant, few directly utilitarian aspects have been recorded for Clethra ; it appears to have neither culinary nor medicinal properties. It is, however, highly attractive to bees and is therefore considered an important honey plant. Sweet Pepperbush inhabits acidic swamps and moist woods, where it may form extensive colonies that expand via rhizome growth. Ease of propagation and its rhizomatous habit make it a useful element in riparian restoration projects. Flowers are visited by a wide variety of bees and butterflies, the former presumably collecting both pollen and nectar, the latter, just nectar. In addition to cross-pollination by insect visitors, published observations indicate that the flowers are also capable of self-pollination. 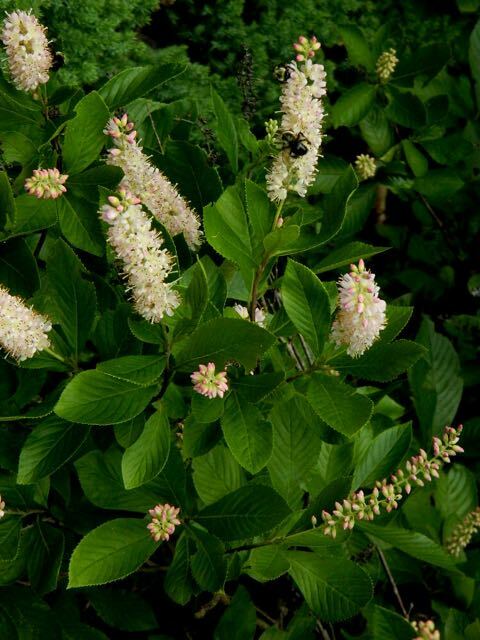 Sweet Pepperbush is found in the coastal plain and outer piedmont of Virginia. As a species it ranges from Nova Scotia and Maine southward to Florida and eastern Texas; seldom found far inland, it is largely restricted to the coastal plain physiographic region of the southern states. Clethra alnifolia is somewhat underutilized as a garden species that offers attractive and sweet- smelling flowers in the summer. Given its predilection for moist soils, it is an obvious choice for planting near ponds or low areas in the landscape. Nevertheless, it can tolerate mesic situations, though it may be more successful in drier locations if provided with some shade. It does spread, so mass plantings well separated from neighboring plants will lessen maintenance issues. Several dozen cultivars exist, derived from naturally occurring variants found across the wide geographic range of the species. 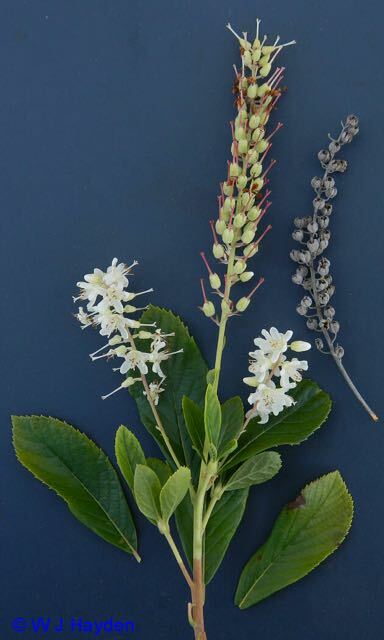 Various Sweet Pepperbush cultivars feature dwarf stature, longer than usual racemes, notably early or late initiation of flowering, and pink shades of petal color. Sweet Pepperbush is easily propagated by division of vigorous clumps, best done in the fall or before the leaves emerge in the spring. Softwood (leafy) cuttings taken in midsummer readily strike root, without hormone treatment. Propagation by seed is best done indoors or in a greenhouse in early spring by sowing the dustlike seeds on the surface of a fine-textured medium kept evenly moist; when large enough to be handled, the seedlings can be transplanted into individual pots and grown for perhaps a year or so before being planted in the garden. From a conservation perspective, Sweet Pepperbush is a common species, its populations abundant and secure. Nevertheless, like all native plants, it is subject to habitat alteration. Gardeners should not collect Sweet Pepperbush in the wild and should be certain that all native plants purchased for home gardens have been nursery-propagated, not wild-collected. For a list of retail sources of nursery-propagated plants and responsibly collected seeds, search on our website’s Nursery List; send an SASE to the Virginia Native Plant Society, Blandy Experimental Farm, 400 Blandy Farm Lane, Unit 2, Boyce, VA 22620; e-mail info@ vnps.org; or call 540-837-1600. To see and learn more about interesting species of plants native to Virginia, browse topics of interest on our website, including the blog, and contact your local chapter of VNPS. Find the chapter nearest to you by , clicking here: Chapter Locations and then you be able to find the times and dates of programs and wildflower walks in your area.